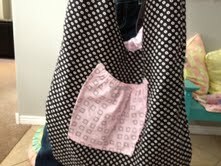 Breanna made this fantastic sling bag in sewing class today. These bags are so popular right now. I helped another student make one a few weeks ago but the pattern was terrible! I tweaked it a bit and came up with this beauty. Kenzly's sling bag. Super cute!